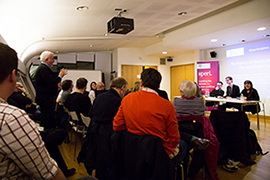 The launch of a special section of the latest edition of the Political Quarterly entitled ‘The Politics of Devolution in England’, hosted by SPERI on Thursday 23 February 2017, provided the setting for a much needed debate on the opportunities and challenges of devolution across Yorkshire. Arianna Giovannini (De Montfort University; SPERI Honorary Research Fellow) and Andrew Mycock (University of Huddersfield), guest editors of PQ special section, gave an overview of the latest developments and shed light on the issues related to the government’s piecemeal approach to devolution. They argued that the case of Yorkshire epitomises the problems that can be seen in the devolution process across England. The recent set-backs with the Sheffield City Region Devolution Deal, issues related to the role of elected mayors and public engagement, and the simple fact that, for the time being, no local authorities in Yorkshire will get a ‘Devo Deal’ seem to suggest that, beyond rhetoric, devolution is still part of an un-codified, ‘muddled’ process based on a centrally orchestrated patchwork of spatial and governance ‘fixes’ that lack a clear roadmap. These themes were also picked up by James Reed (Political editor of the Yorkshire Post). James gave his views on the highs and lows of the devolution process emphasising the difficulties of getting citizens involved as well as the urgent need to get the debate going, so as to make a break through in the region and ensure that Yorkshire is not left at the margins of the process. The event brought together academics, policy-makers and media representatives with an interest in the process which led to a lively Q&A session. All the articles included in the section of the Political Quarterly that was launched at the event are currently available on Open Access and can be downloaded at this link: http://onlinelibrary.wiley.com/doi/10.1111/poqu.2016.87.issue-4/issuetoc#group5. 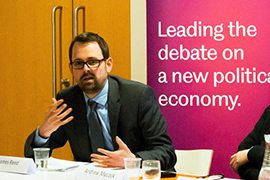 Newer New SPERI-APPG event in Parliament | Corporation tax: a global race to the bottom?